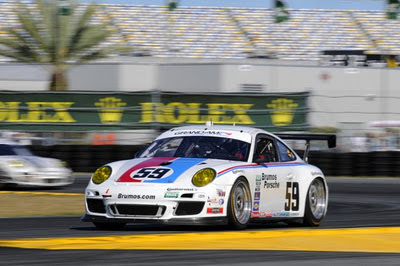 Setting the fastest time in qualifying, Porsche pilot Andrew Davis (USA) secured pole position in the strongly-supported GT class at the Daytona 24 Hours. For the 50th anniversary of the long-distance classic in Florida/USA, he shares the cockpit of the Porsche 911 GT3 Cup fielded by the winning Brumos Racing squad with Porsche works driver Marc Lieb (Germany) and American Hurley Haywood. With five overall wins and six class victories, Haywood is the most successful pilot in the history of this race. On board the car with the legendary starting number 59 is Leh Keen (USA) as the fourth driver. With the Porsche 911 GT3 Cup run by Magnus Racing, Andy Lally (USA) turned the third quickest lap. His teammates for the race are Porsche works driver Richard Lietz (Austria),John Potter (USA) as well as René Rast (Germany), the two-time champion of the Porsche Mobil 1 Supercup. Porsche factory pilot Patrick Long (USA), who shares driving duties with his works driver colleague Joerg Bergmeister (Germany) as well as Seth Neiman (USA) and Mike Rockenfeller (Switzerland) in Flying Lizard Racing’s Porsche 911 GT3 Cup, posted the fourth quickest time.